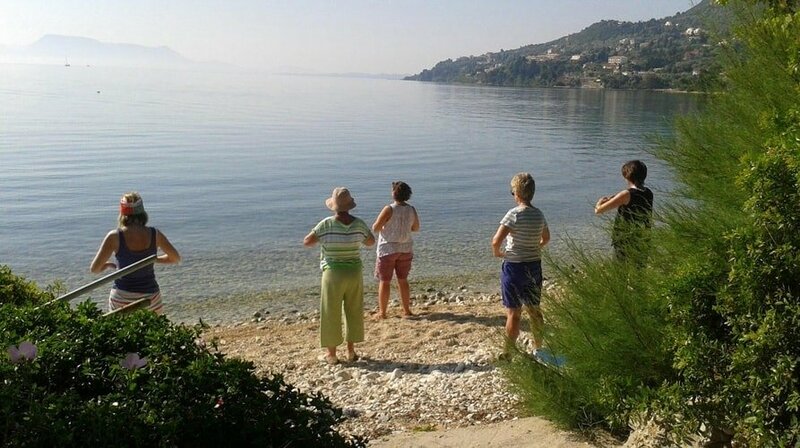 Led by Zen Buddhist meditation teacher Kim Bennett, a down-to-earth yet incredibly warm woman with an infectious sense of humour, these affordable healthy holidays take place in Nikiana, a friendly seaside village on Lefkada in Greece, where you stay in self-catering apartments and dip in and out of activities. Meditation and mindfulness sessions are on offer with optional courses in wellbeing, spirituality and personal growth as well as walks, therapies and local trips. Laid back but deeply caring, the relaxing holidays tend to attract people who have started to question their lives and want to live more meaningfully. These retreat-type holidays are run with genuine grace and from-the-heart by a woman who knows her stuff. You will inevitably meet interesting people and have fascinating conversations. The village is so friendly, you feel like a local within days. The location lacks a lovely indoor meeting place in the village. Not having a specific ‘centre’ is a little discombobulating, and sometimes it can be hard to find people. It’s a small quibble, though, and Kim is always available by phone. The major focus for the retreat is complete relaxation, and the timetable is up to you. If you want you can choose to do absolutely nothing except relax on the beach or potter around the village. Or go to the morning meditation and guided walks – no need to book for these – just turn up if you’re feeling in the mood. There are also are a range of wellness courses you can book into during the week. Each morning there’s a simple sitting meditation, usually held outside a few footsteps from the beach. This is taught from a Zen perspective – encouraging you to discover, by direct experience, who you truly are and the freedom that comes with that knowing. Three mornings a week there is a qi-gong based mindfulness movement session on the beach followed by a 15 minute meditation. The meditation is guided and usually focuses on the breath. A mindfulness walk takes place each week – walking not to reach a destination but to enjoy each step, moment by moment, using all the senses. There is also an early morning trip to the local waterfalls where guests are encouraged to sit and engage their senses, once again. Kim also runs additional (and complimentary) courses in Zen meditation and mindfulness during the week that you can book onto. 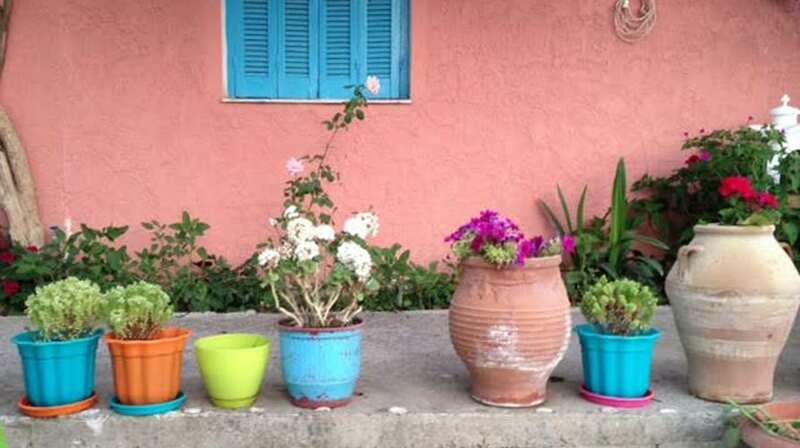 During your stay in Greece there are a range of interesting, enlightening wellbeing courses you can pick and choose from which tend to focus on nudging you into different ways of engaging with your life and about finding easier ways of living with oneself. They are totally optional and can be booked beforehand or on arrival. Groups are small and, where possible, courses are held outside to make the most of the weather and the setting – if not outside then in an apartment. The courses that Kim runs are by donation, guest teachers courses cost between £50 and £100 per person. Teachers are carefully picked and of a high calibre and vary from year to year. Jane Matthews’ courses are always popular. Her ‘Living Softly’ shows how to stop sabotaging yourself and allow yourself to create healthier relationships and a more peaceful, creative life. Alison Goode is a graduate from Breathworks and offers an Introduction to Mindfulness. Gill Hack is an accredited Zenways teacher and leads a course on Meditation and Mindfulness for Wellbeing. Treatments are optional and you pay the therapist directly. They are held in a small but comfortable room. Kim is careful to pick excellent bodyworkers and now works with a local lady, Giota, who specialises in therapeutic massage, reflexology and facial massage. You’ll have your treatment in an apartment set aside only for treatments. You’ll be staying a step away from the beach, where there are free sun loungers and umbrellas to use. There are two pebbly beaches and neither gets very busy at the time of year the retreats run and the water is clean and safe to swim in. A short walk away you can also find a sandy beach. Bring a towel or sarong as beach towels are not provided. Watersports are also available in the village – SUP boarding, windsurfing are always on offer, and depending on demand sailing might be possible to arrange. Take off on your own up the mountain road or meet up for a free guided walk that usually takes place on Wednesday morning. 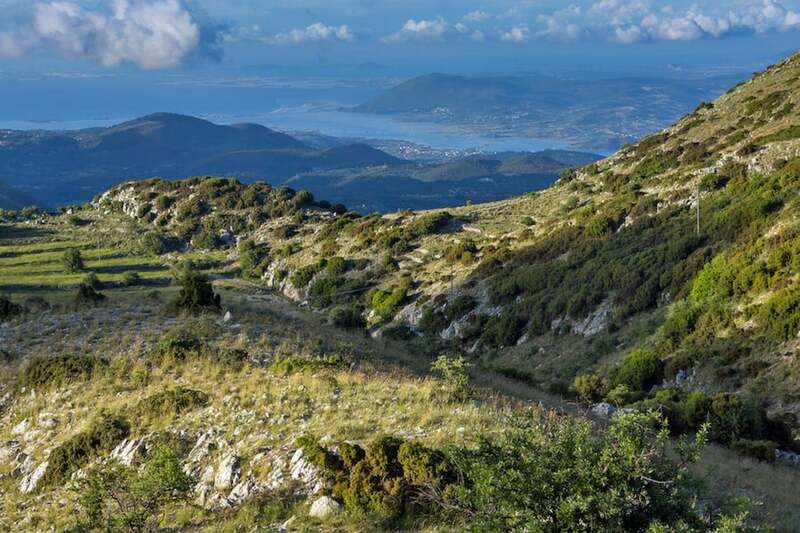 There’s also a herb walk in the mountains with the gentle and knowledgeable Aris, which is highly recommended. It’s a gentle hike stopping every few paces to investigate a plant, learning its history, its mythology, its healing properties, culminating at the grounds of Ayios Georgios, an abandoned monastery. A slow meander then takes you into the tiny village of Kolivata for lunch with Maria, a kitchen goddess who lays out a feast: long peppers stuffed with piquant cheese and herbs; spicy little meatballs; salad plucked from the garden a few scant hours before. You can book a guided walking in the mountains once a week. You can also book some lovely island tours and boat trips locally, or hire a car to explore the island (guests often club together to share the cost). 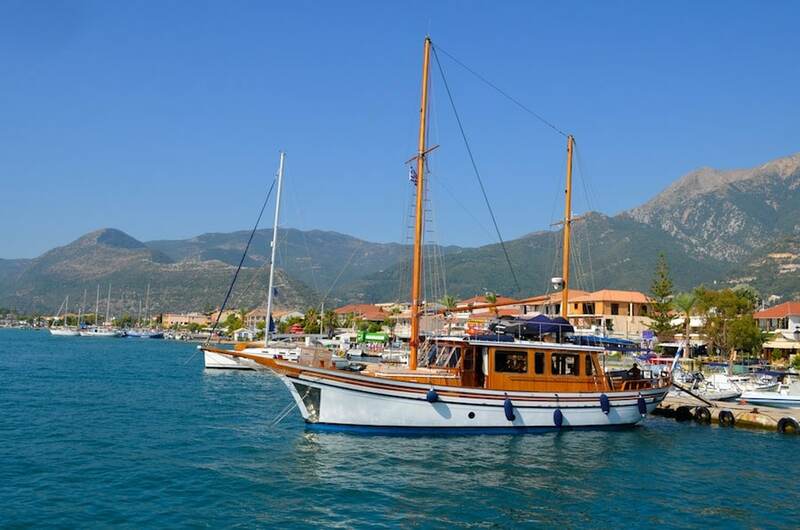 Recommended is a trip on the MS Christina to explore the ‘forgotten’ islands of Kastos and Kalamos. There are several opportunities to swim and snorkel off the boat or just lounge on deck like lotus eaters, lapping up the sun. On the way back to harbour you explore the coastline of Skorpios, the island of the doomed Onassis family, mooring off the beach that was supposedly the favourite of Maria Callas. 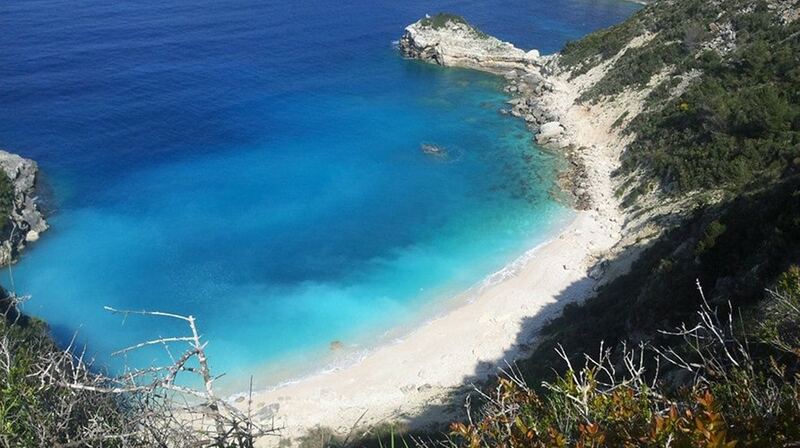 The famous beaches of Porto Katsiki and Egremnoi, the monastery of Faneromeni, and the beautiful bays of Poros and Vassiliki are also easy to reach. 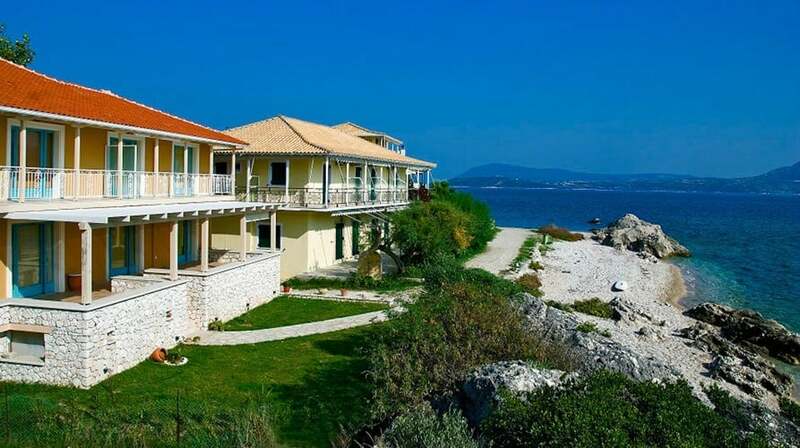 You stay in a range of self-catering apartments right on the beach with lovely views of the sea, beach and mountains. Some apartments also have views behind onto the mountain into which the apartments nestle. All have simple ensuite bathrooms, kettles, cooking facilities (a hob at Tassoula’s but full ovens at the other properties) and fridges. 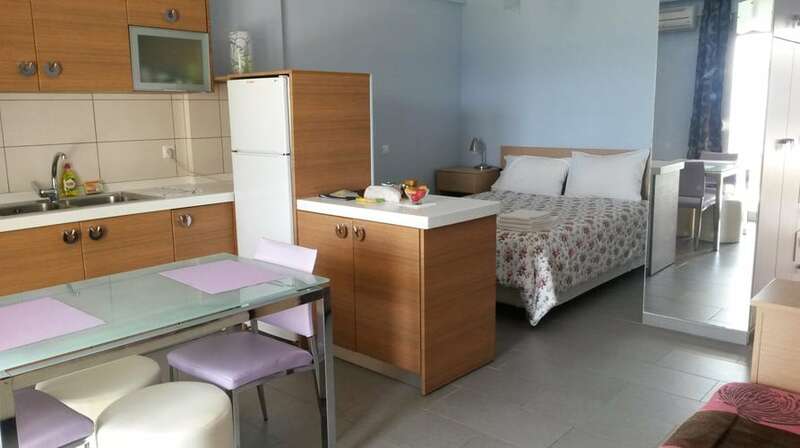 Both Tassoula Studios and Pana’s Apartments are simple self-catering apartments – traditional, basic but spotlessly clean and rather charming. 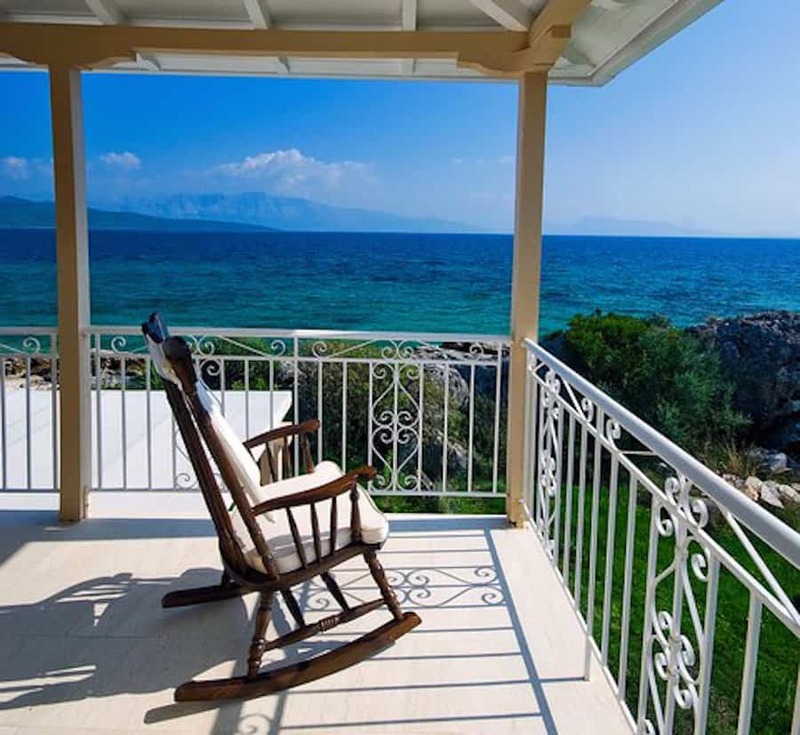 Lefkothea Studios and Theo’s Apartments are more modern and stylish in feel and more upmarket. Theo’s has a separate kitchen, lounge, bathroom (with bath) and bedroom. 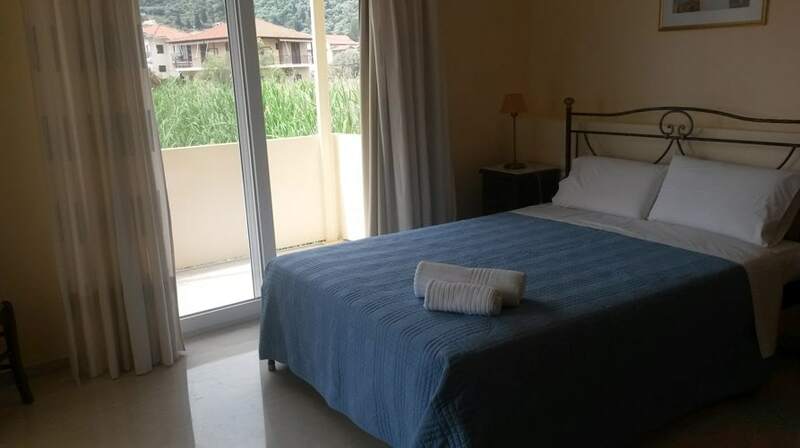 All the accommodation has outside access either with a balcony or patio and are steps away from the beach where sunbeds are available for all. Lefkothea has a garden area out front you can use too. Theo’s and Pana’s are best for more privacy and the best views, or go for Tassoula for a slightly more sociable experience. 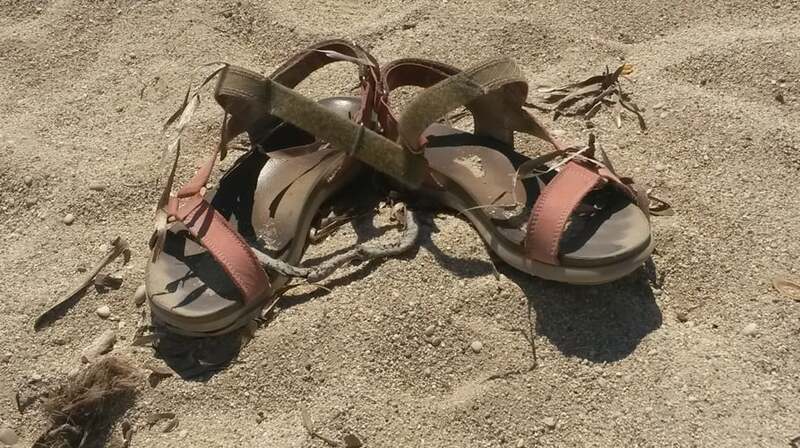 Bring jelly shoes for the pebbly beach (although these are easily bought in the village) and closed toed sandals/trainers for some of the trips – because there is some scrambling up rocks on the Herbal Walk and gravelly paths on the mountain walks. And bring layers! If you’re looking for complete peace and quiet, early May and late September/early October are the best times to visit. The weather during these times is still good and sunbathable but changeable. If you want more reliably hot weather, then June and early September are a better bet. The meditation space: The courses all take place in the meditation space, a quiet patio garden surrounded by roses and herbs, next to Pana’s apartments. It’s just a minute’s walk from the beach and looks out to sea, and is sheltered by mature pine trees, although there is always a spot for the sun lovers to sit in. If the weather isn’t so good and then the group moves into an apartment a few steps away with the same views. The village: Nikiana is a down to earth, friendly village and Serenity’s great reputation for supporting the local economy means superb service and a warm welcome wherever you go. All meetings other than the courses take place at the local café Pepe Le Pew, which is also the pick up point for most trips. You’ll be well received here and never made to feel like you need to buy a drink to sit and wait. The café is also the place that most people arrange to go to for a chat, unless they go to the beach or gather in the spaces outside their apartments. The village is not picture postcard pretty on arrival, and some of the back roads are a little down at heel, but the position and views from the accommodations make up for this. A main (but not busy) road cuts through the main street which houses the majority of shops. Most tourists tend to be Italian or other Greeks (from the mainland). Apart from an initial welcome lunch, you sort out your own food – either by self-catering or eating out (with or without fellow guests). There are three mini-supermarkets in Nikiana for self-catering supplies where you can buy fabulously fresh veg, nuts and meats and cheese that are all locally produced (and practice your Greek!) 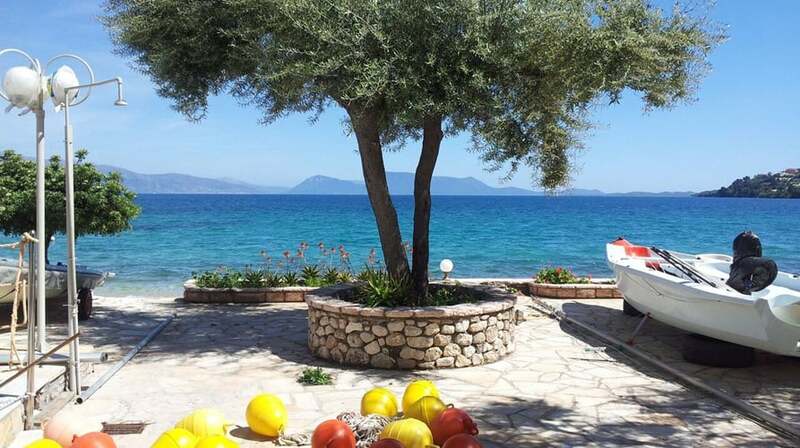 though prices are extremely reasonable at the local restaurants; a Greek salad or something like stuffed peppers or a pasta dish starts at 7 euros, and larger main courses cost around 12 euros. It’s best to bring any supplies such as supplements or dried goods you like to eat daily that you wouldn’t get in a simple shop. 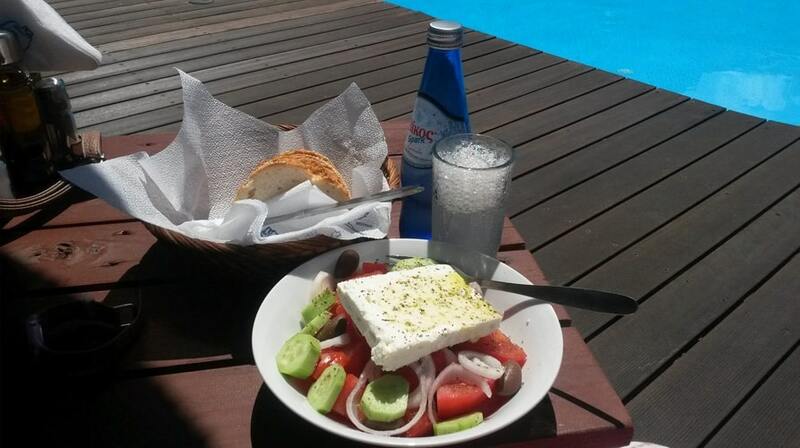 Restaurants serve typically Greek food – good kebabs and the inevitable chips, but also seafood, salads and plenty of vegetarian options such as Tzatziki, oven roasted vegetables in the oven, Horta (local greens), cheese or vegetable filo pasty pies, and courgette fritters. The bakery offers superb pies (the spinach ones are moreish) and the internet café Pepe le Pew does good coffee; iced, expresso, cappuccino and so – Lefkada has a strong Italian influence.The group tends to pick a particular taverna or restaurant for informal meet-ups- so you never need eat alone if you don’t wish. Local wine is cheap and perfectly quaffable or you can spend more for imported vintages. Little foody surprises await in your welcome pack, and Kim will take you around to introduce you to local shop owners and recommend the best places to buy your feta and bread, for example. Huge emphasis is placed on keeping money in the village and so local people are used for transfers, car hire and welcome meals. Recycling is only just being introduced on the island but Serenity do what they can to support it. Food is sourced locally as far as possible, energy is fossil fuel so you’re asked to take care with things like air conditioning – not leaving it on when you go out etc.